The spring bulbs are blooming here on Vancouver Island.... thankfully! It's been a hard, cold winter by Island standards. It's so heart-warming to see the crocuses, daffodils and lots of other bulbs breaking into blossoms. Blue flowers, white, yellow and orange daffodils at VanDusen Botanical Garden, Vancouver. The brown gives nice contrast to the light yellow flowers. When I lived in Vancouver, VanDusen Botanical Garden was my go-to garden. I love the colour combination of blue, green and yellow in this image. 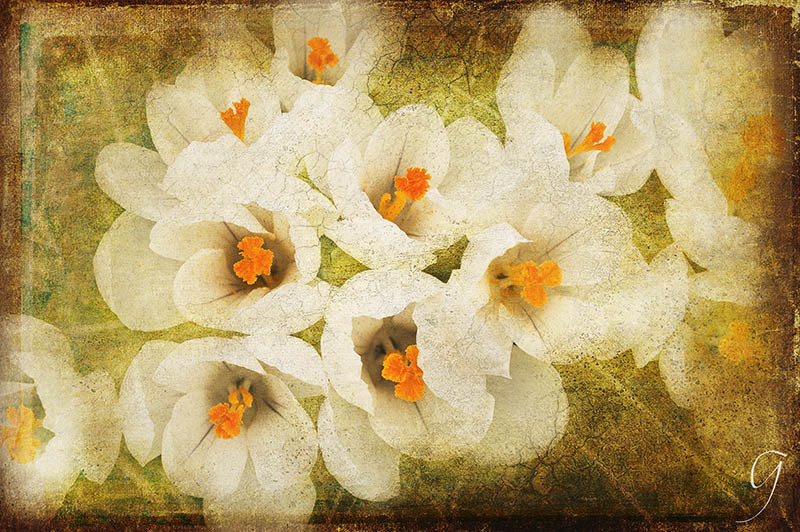 I love playing with layers and textures in Photoshop and I ended up with 8 layers of textures for these white crocuses. The image looks old and cracked like an old painting. Shooting from above a flower isn't always a good idea. The soil is the background... not flattering for pictures. 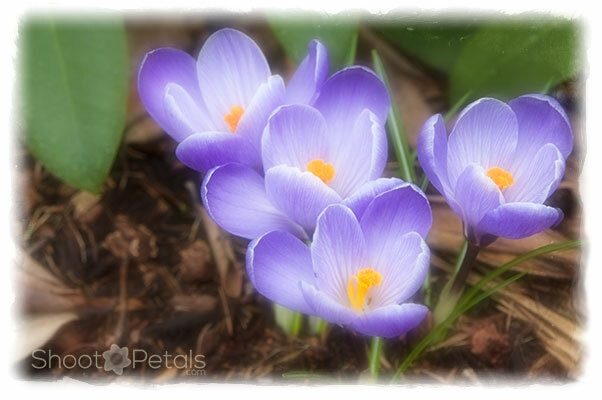 With a flower that looks up to heaven, like these crocuses, it works with the texture layers. Spring bulbs, white crocuses at VanDusen Botanical Garden. Textures added in Photoshop. If you aren't using Manual yet, try using the 'semi-auto' digital camera modes. To create background blur, you want to use Aperture Priority. Getting down to the level of the flower is another option. 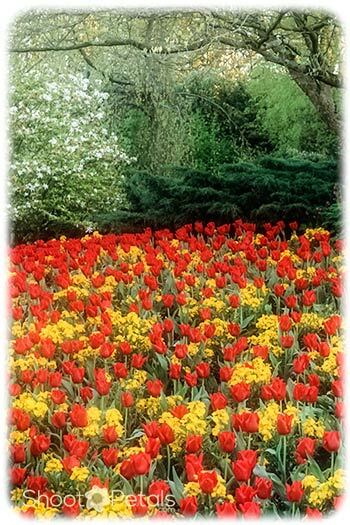 A lot of spring bulbs are quite small so you may feel a bit silly but don't worry. 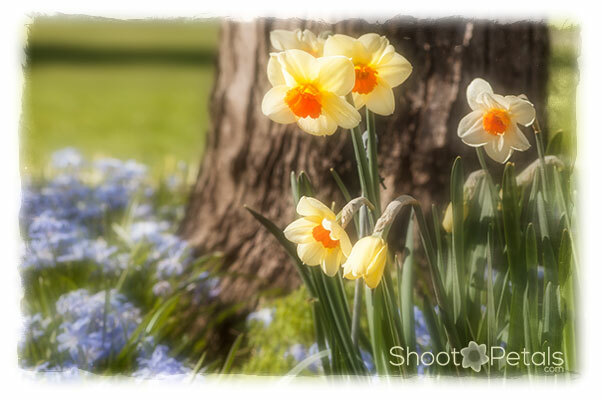 That's how I photographed these daffodils. Unfortunately, the grass was really wet and my jeans soaked up the dampness. A small price to pay for several nice photos. Have you ever noticed how plants follow the sunlight during the day... they swivel so they always get a good view of the sun. If you're a gardener, you've seen your flowers move over the course of a day. Sunflowers are great examples. The behaviour is called heliotropism. Houseplants grow towards the light and its a good idea to keep turning them so they grow evenly. Know where the sun is at certain times of the day in your garden and you can plan the time you want to take your photos to get the background you want. White daffodils looking toward the sun. Picture taken at Stanley Park, Vancouver. Photo edited with lightened edges, glow effect and white frame. If you know when your flowers are going to be staring at the sun... or, if you want to catch them from the side. 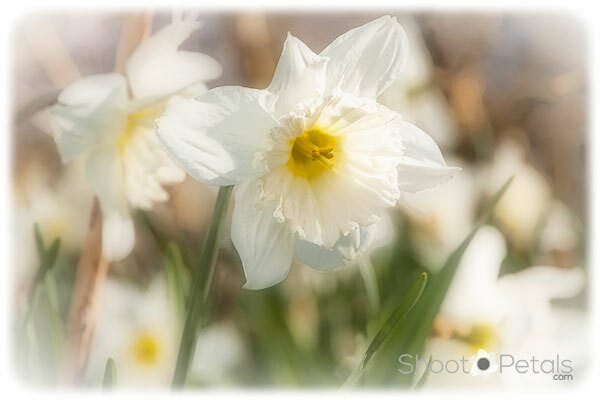 Like this shot of white daffodils. I focused on the centre flower and used a large aperture (f 4.0) to blur all the other flowers. If you shoot RAW (instead of JPG), you're going to do at least some tweaking in your photo editing program. RAW is the equivalent of a negative and a RAW file always needs a little something. Looking through a macro lens is intriguing. Macro and close up are not quite the same thing. You can get some amazing close-up shots with a good quality lens but a close up isn't a true macro image. 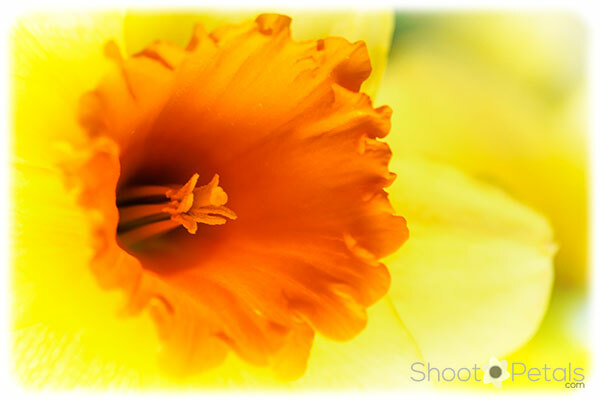 A glowing yellow daffodil with bright orange cup. Photo taken with Nikon 105 mm macro lens. With such a shallow depth of field (DOF), the only sharp parts of this photo are the edge of the frill, the pistil and filaments. They're all on the same narrow"slice" in space and I focused on the edge of the frilly cup. I had to move just a bit to include the pistil into sharp focus. When you look through the viewfinder or at your screen, take your time and check all the details like focus, background (any trash), close enough or far enough away. You can do all that successfully if you have your camera in a fixed position on a tripod. If you use a macro lens, you need a tripod. Textures are so much fun. When I'm out with my camera, I always find some surfaces or scenes that would make topnotch textures or backgrounds for my images. Maybe an interesting sky, the side of a rusty building, the bark on a tree. Use your imagination. You'll need a photo editor that uses layers. Photoshop is my editor of choice but you can find other photo editors that don't have such a steep learning curve. OnOne software is free if you want the programs that came before Photo Suite 9. Older doesn't mean inferior! They're incredible so check out the freebies. 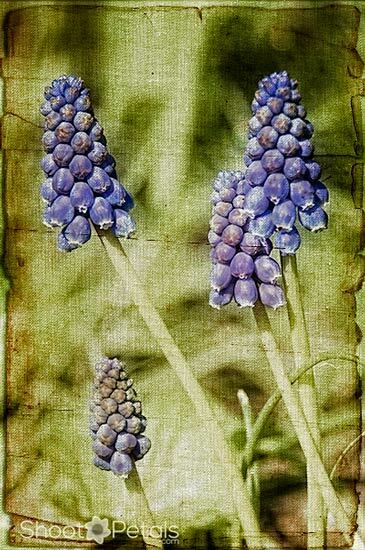 Grape hyacinths edited in Photoshop using blue linen and antique paper textures. These spring bulbs are grape hyacinths. I gave them 2 texture layers... the 1st layer is a linen fabric and the 2nd is an aged piece of paper. It looks like the photo is printed on an old piece of linen with tattered edges. The linen was blue so it changed the brilliant coloured greens. And the paper was brown so the combination makes the image look very old. This image, with the various layer additions, was edited in Photoshop. A hint when you're working with your original files. You don't want to alter your originals. Don't make the mistake of working on one, then saving it. If you do that, and you close the file, it's gone. Make sure you always work on a copy or use the "save as". There's nothing quite as sickening as when you realize you hit "save" and lost your original file.. forever. Easiest answer... always open and work on a copy. Dreamy purple-blue spring crocuses. Photo edited in Photoshop and Perfect Effects with softening and light vignetting. I lived in Surrey, BC for a year, between overseas jobs. Green Timbers Urban Forest was close by. I spent a lot of time running or taking photographs there. It's temperate rainforest, a unique environment. All the spring bulbs bloomed at the entrance to the forest. All kinds of flowers... everyone had cameras with them. My favourite time was early morning. I enjoyed the sounds of nature before other people arrived. Deafening frog calls from the pond... "ribbit". All sorts of rambunctious bird songs, though the birds were usually invisible in the thick tree tops. What's more spring than red tulips? Maybe yellow daffodils, of course. This vivid garden of spring bulbs is at Queen Elizabeth Park beside the Bloedel Conservatory. The contrast of the red and yellow leaps out from the green background. Red and yellow are hot, high energy colours... but the green is cool and relaxing. Tulips have a whole page of their own. You'll find them here. Spring bulbs - vibrant red and yellow daffodils beside Bloedel Conservatory in Vancouver. Hot glowing colours with cool but saturated green folilage. Vignetting is really a term that applied to lenses and it wasn't desirable. Certain lenses, or lenses at a certain focal length, would leave an unattractive dark circular area in the corners of the photo. Now, vignetting has become a popular artistic touch and it's applied to either darken or lighten up the edges of the photo. It highlights the central subject. Orange-belted bumble bee on purple crocus. Image taken at Green Timbers Forest, Surrey, BC. Photo edited with edge lightening and white frame effect. 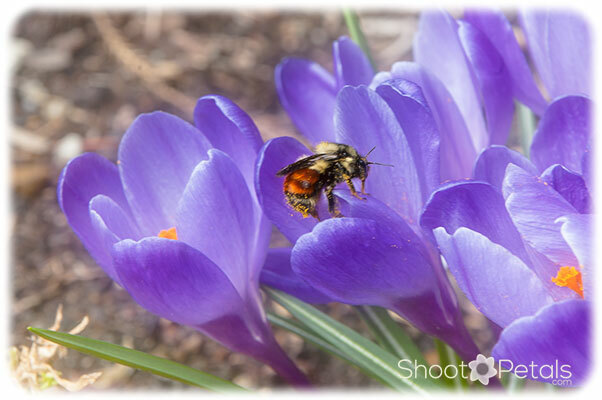 What better subject to highlight with spring bulbs than a bee? First time I ever saw these huge bees with red-orange butts, I had to get them on camera. Some of them were so heavy in orange pollen, they looked like they were entirely orange! They're called Orange-belted Bumble Bees. The bees are in terrible trouble, dying off in huge numbers, mostly because of chemical sprays... neonics and others. Without the bees and other pollinators, we're in big trouble and we have an obligation to do whatever it takes to save them. After a cold, dull winter, spring bulbs bring back the cheer to life. They don't have long with us each spring so get that camera out, SLR, point and shoot or your cell phone camera (check out iPhoneography here). When spring arrives, make sure you always have your camera with you. 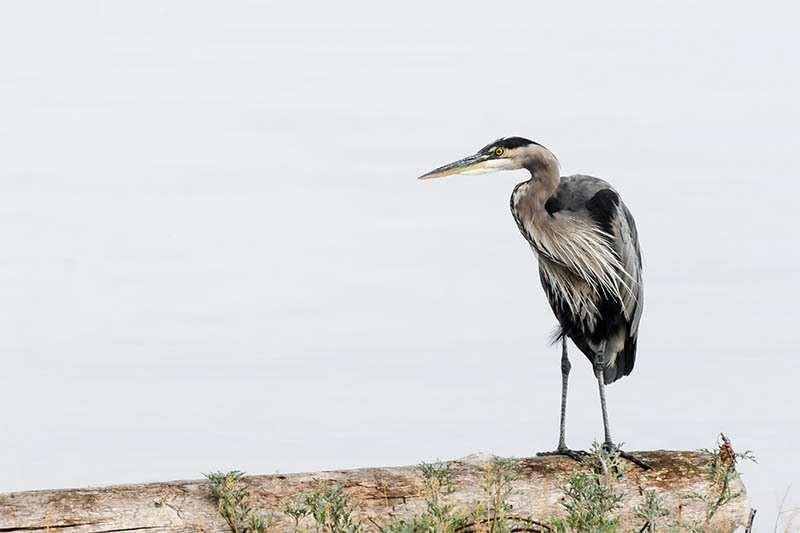 Review some basic photography, like composition (golden ratio, rule of thirds, leading lines) and exposure (shutter speed, the histogram, aperture). And take your tripod and camera manual along with you. If you use Auto Mode, venture out a little and experiment with your digital camera modes to get more creative control over your photos. Sunny daffodil and purple crocuses. 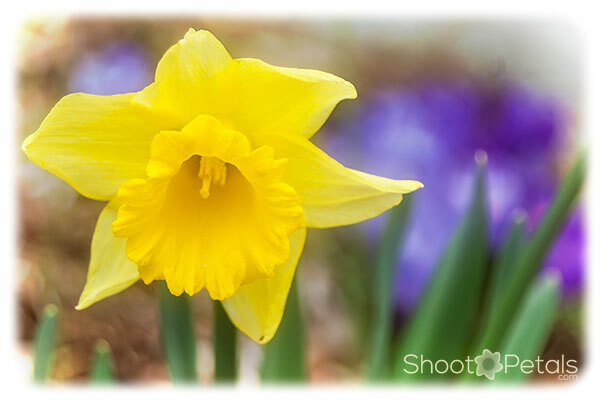 The crocuses are totally blurred and make a colourful background for a lemon yellow daffodil. Enjoy your spring days in the garden.